Community service was not a new concept for Will Pfitzner when he arrived on NC State University’s campus as a Shelton National Leadership Scholar four years ago. The Mount Airy native had volunteered regularly in his hometown. But NC State’s Gen. Hugh Shelton Leadership Center, which administers the Shelton National Scholarship, introduced him to a broader world of service and leadership. Now a senior biomedical engineering major in the College of Engineering, Pfitzner is looking forward to graduating in May and applying the lessons he learned at NC State. 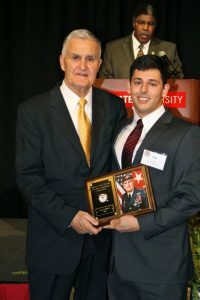 The Shelton Leadership Center was founded in 2002 following the retirement of Gen. Shelton, who is an NC State alumnus, as chairman of the Joint Chiefs of Staff. The center works to inspire, educate and develop values-based leaders committed to personal integrity, professional ethics and selfless service. Shelton Scholars are recipients of either the Shelton National Leadership Scholarship, which students apply for as incoming freshmen, or the Shelton-Caldwell Fellows Scholarship, which students apply for during their first year on campus. Pfitzner was ecstatic when he received the Shelton National Leadership Scholarship, which provides financial support and opportunities for service and leadership development. He said the scholarship was a win-win. The summer before his freshman year at NC State, Pfitzner was invited to participate in a sustainable agriculture trip to Honduras through the Shelton Leadership Center. Since that first trip to Central America, the Shelton Leadership Center — in partnership with 4-H and the Future Farmers of America — has allowed Pfitzner to participate in service trips to Costa Rica, Ecuador’s Galapagos Islands and back to Honduras, where he even met with one of that nation’s former presidents. Pfitzner’s service closer to home includes helping to feed homeless people in downtown Raleigh and projects in Gen. Shelton’s hometown in eastern North Carolina. During the course of their time in the program, Shelton Scholars like Pfitzner have several opportunities to meet with the leadership center’s namesake. Pfitzner said Gen. Shelton and his wife Carolyn play an active role with the students. During a reception at the annual Shelton Leadership Forum last November, Gen. Shelton expressed his confidence in the ability of the Shelton Scholars to act as values-based leaders in the future. Pfitzner is already applying principles from the Shelton Leadership Center in his work at LazerEdge Designs, a startup he founded with other NC State students in 2014. The company specializes in laser-cut wooden décor sold through its website and at home shows. It launched from the NC State Entrepreneurship Initiative Garage, a business creation and prototyping space for students. LazerEdge, which employs several NC State students in part-time positions, supports the community by donating a percentage of proceeds on some items sold to local organizations. The business also donates items to groups’ silent auction fundraisers. If it were not for the Shelton Scholarship, I would not have been in the mindset that I needed to give back. You have a social responsibility as a citizen to give back and to make your community better. Pfitzner is grateful for the donors whose philanthropy made his scholarship possible. He said their support provides a boost of confidence for students like him. Beyond the financial support, Pfitzner values the chance to build relationships with alumni and donors. Pfitzner has already accepted a job at a consulting firm, and he plans to support NC State as an alumnus. You have so many opportunities at NC State. The first thing I think of is how to give back.